Host Your Own Community Swap! We are pleased to announce the release of our new DIY Swap Guide! Since 2007, GrowNYC has hosted 270 Stop ‘N’ Swap® community reuse events across all five boroughs. Our goal is to provide each of NYC’s 59 community districts an annual opportunity to find new homes for unwanted items that might otherwise end up in a landfill. Still, the demand for reuse and desire to host and participate in community swaps extends beyond our program’s capacity. We created this guide to assist schools, community organizations, and passionate individuals interested in hosting their own swap events! Whether you are looking to host a curated event for items such as clothes, books, or toys, or a big event where anything goes, the guide will help you identify an event location, map out your swap footprint, gather event materials, outline a training for your volunteers, and more. We hope this guide will be a launching pad for more free reuse events across NYC. If you use our guide to host a swap, we’d love to hear from you! Feel free to send us a note at recycle@grownyc.org or tag us on Facebook, Twitter, or Instagram (@GrowNYC). Need further incentive to try out some creative reuse ideas in your neighborhood? Citizens Committee is currently accepting applications for micro-grants of up to $3,000 to resident-led groups working on community projects in the NYC, including those related to waste diversion. For more information, visit their website here. Read more about Host Your Own Community Swap! Fighting Food and Clothing Waste - 15 Million Pounds and Counting! As the curtain closes on 2017, we mark TWO milestones for GrowNYC’s zero waste programs. We are thrilled to announce; thanks to YOU we have collected more than 10 million pounds of food scraps at our Greenmarkets! There’s more! YOU have helped keep 5 million pounds of clothing and textiles from going to landfills by dropping them at collection sites hosted by GrowNYC. Thanks to your participation that’s 7,500 tons of material repurposed to build soil, create renewable energy, or live a second life as usable clothing, rags, or recycled fiber products! What started as 6 Greenmarkets in 2011 has grown to 42 food scrap drop-off locations at GrowNYC’s Greenmarkets, Youthmarkets, and Fresh Food Box sites throughout the City! Not to mention the 18 new Compost On-The-Go locations near mass transit in Northern Manhattan and the Bronx. 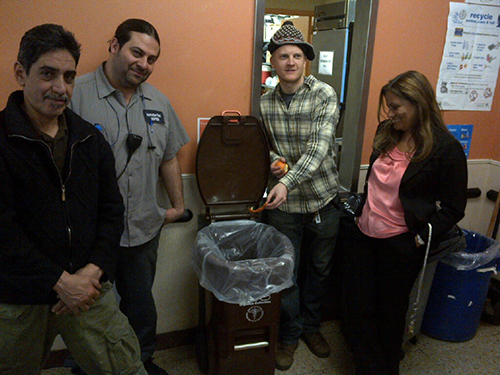 Hats off to you and your fellow dedicated New Yorkers who save, store, and transport their scraps each week. New Yorkers are equally dedicated to style, and demand for clothing collections continues. What began as “Material Mondays” at Union Square Greenmarket is now a network of 27 markets accepting clothing each week through our partner, Wearable Collections. Every shirt, suit, and pair of shoes collected helps chip away at the 193,000 tons of textile waste New Yorkers send to landfill each year – 5 MILLION POUNDS AND COUNTING! Food scraps and textiles comprise nearly one-quarter of NYC’s residential discards. Thanks to you, these efforts are one successful component of getting NYC to zero waste. Find a clothing collection or food scrap drop-off near you. GrowNYC’s zero waste programs are funded by the NYC Department of Sanitation. Read more about Fighting Food and Clothing Waste - 15 Million Pounds and Counting! Over the past year, an exciting thing has been happening: recycling is rolling out at NYCHA developments citywide. 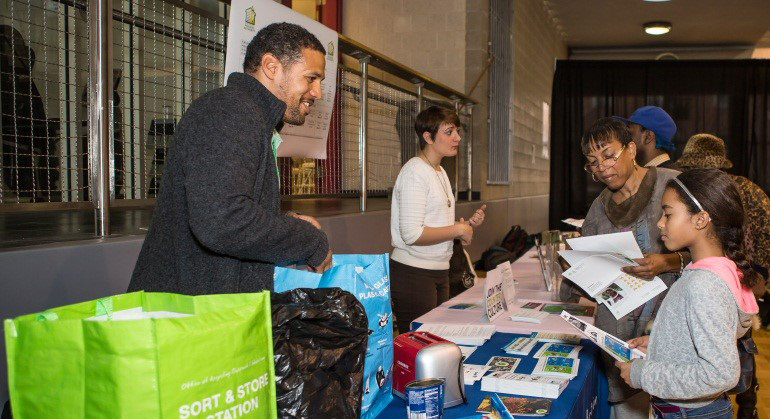 As a partner in community engagement, GrowNYC has provided recycling education at workshops and events, aiming to change the way more than 400,000 New Yorkers take out the trash. This winter, GrowNYC is launching a new volunteer program for NYCHA residents who want to see this program succeed. Through our Environmental Ambassadors program, we will train volunteers to educate neighbors about recycling at their developments. After completing two, 2-hour workshops, Environmental Ambassadors conduct 12 hours of local outreach to encourage participation in the NYCHA Recycles! Program. Volunteer benefits include field trips, gear, gift bags and a certificate of service signed by the DNSY commissioner and a NYCHA executive. Live at NYCHA and want to make a positive change where you live? Learn more and register today! GrowNYC's zero waste programs funded by the NYC Department of Sanitation. 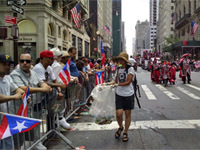 GrowNYC and the Sierra Club of Puerto Rico "floated up" Manhattan's Fifth Avenue at the festive National Puerto Rican Day Parade on Sunday, June 16. The green team volunteers hauled clear bags stuffed with recyclable materials collected from the audience onto the float, giving some 2 million spectators a remarkable snapshot of waste reduction efforts at the event. Volunteers collected more than 489 pounds of recyclable materials--a 54% increase from last year. GrowNYC's free event recycling services included volunteer recruitment, outreach to parade float participants before the event, education on recycling rules and the creation of an event recycling plan to reduce waste at the parade. The weekend before Thanksgiving, residents in one Chinatown complex took time to “unstuff”—closets and drawers, that is—bringing 2,500 pounds of unwanted clothing to a special collection in their building. 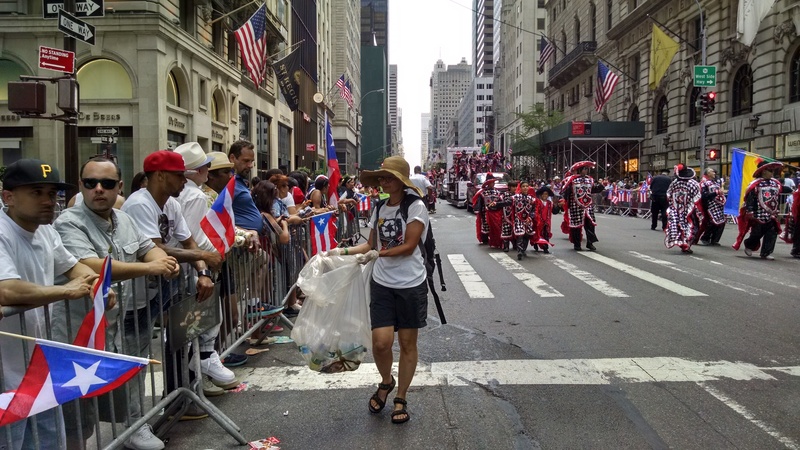 In 2012 GrowNYC hosted an Earth Day textile collection as part of a larger community event in Chinatown, attracting residents from the nearby Confucius Plaza Apartments, who asked for more convenient opportunities to recycle unwanted clothing, shoes, linens and other textiles. With the help of our Manhattan Recycling Outreach Coordinator, the co-op held the first of what is now a bi-annual collection at the 762-unit apartment complex. GrowNYC advised management on the logistics of setting up a collection, connected them Wearable Collections (who also collects materials from Greenmarkets) and provided outreach and education assistance, from promoting the collection to educating residents about recycling with the help of bilingual volunteers. In the past two years the building has hosted six events and collected over 6.5 tons of material that will be reused or recycled into new products. Plans are underway to establish more frequent collections as resident demand for this service shows no sign of slowing, and building staff appreciate the lighter loads they must manage when taking out the trash. Want to recycle textiles in your apartment building? Check out refashioNYC to see if you are eligible for a free collection bin, contact Wearable Collections about in-building programs or find a Greenmarket drop-off site near you. With Halloween 2014 coming on the heels of the BoxTrolls movie, recycled (and recyclable) cardboard costumes are sure to be in high demand. Even if you won’t be creating one of these characters, we’ve got great tips for greening this season of ghosts and gourds. * Make crafty trick-or-treat sacks using recyclable paper bags and paper scraps or put removable decorations on tote bags or pillow cases for an extra sturdy, reusable option. Find great ideas for decorations, party planning, costumes and more at planetpals.com. * Create costumes from items you already own and avoid purchasing unnecessary single-use items. Find new-to-you ensembles and donate your old ones at GrowNYC's Halloween Costume Swaps on October 25 and 26 or try your local thrift store for inspiration. Get great recyclable costume ideas for all ages from the Cardboard Costume Challenge and Inhabitots. * When you're finished showing off your costume, recycle it! Use your building's textile bin if you have one or find a Greenmarket collection near you. * Compost your jack-o-lantern in your backyard or curbside collection bin, at a Greenmarket food scrap collection or see if community groups and gardens near you accept scraps for composting. Make it a family affair, complete with snacks, at a Pumpkin Smash 2014 event, sponsored by the NYC Compost Project. * Too much candy? Find a local dentist participating in Halloween Candy Buyback, where kids can get prizes or even cash. Candy is donated to Operation Gratitude, for inclusion in care packages for troops overseas. 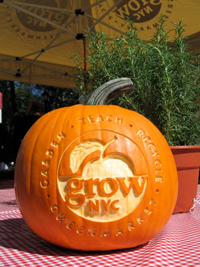 Read more about Green Your Halloween! GrowNYC Greenmarkets are opening for the season throughout the city, bringing with them not only a bounty of fresh regional products, but also expanding weekly opportunities for New Yorkers to recycle textiles and compost food scraps. 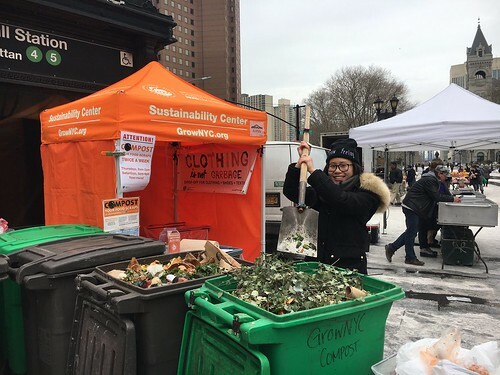 In 2007, GrowNYC’s newly-created Office of Recycling Outreach and Education began testing a program to collect clothing and textiles at Union Square and Grand Army Plaza Greenmarkets. Tax-deductible donations of textiles such as clothing, shoes and towels are collected and later sorted for reuse, or recycled into new products such as wiping rags and insulation. We quickly discovered New Yorkers’ dedication to living sustainably and have met their demand for more recycling--36 Greenmarkets now offer this service, with 10 new locations starting up this spring and summer. Since 2011, GrowNYC has worked to complement existing Greenmarket food scrap collections run by BIG!Compost and the Lower East Side Ecology Center, to meet the growing chorus of Greenmarket shoppers wishing to bring back trimmings from their weekly market haul. Today, in partnership with the NYC Department of Sanitation and community partners, 38 Greenmarkets host food scrap drop-offs at least once a week. Material collected is transported to one of several local sites in the five boroughs where it is transformed into compost, a fertile soil amendment for use in urban farming and gardening programs. GrowNYC has collected more than 2.7 million pounds of textiles and 2.85 million pounds of food scraps at dozens of Greenmarket collection sites throughout the city. Together, food scraps and textiles comprise 23% of NYC’s waste, making efforts like these critical to reducing the big apple’s environmental footprint. Find a list of Greenmarkets accepting food scraps at www.grownyc.org/compost and a list of textile collection sites at www.grownyc.org/clothing, or call 212-788-7964. NYC Residential Organics Collection is Growing! Organics make up almost 30% of NYC's residential and institutional waste stream. This includes yard waste, food scraps, compostable paper (tissues, napkins, soiled paper, paper plates, etc. ), and other materials suitable for industrial-scale composting. By collecting this material, NYC can reduce the amount of waste sent to landfill and incinerators, reducing expensive export costs and greenhouse gas emissions, all while generating a valuable material that can be used as fertilizer in NYC parks and gardens. 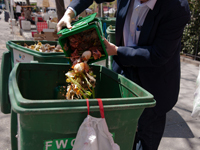 In May of 2013, the NYC Department of Sanitation (DSNY) began a bold, new initiative to provide curbside collection of organics. The Program started in Westerleigh, Staten Island and this fall has expanded to include communities in the Bronx, Brooklyn and Staten Island, with further expansion in the spring of 2014. Wondering how you can participate? The City provided bins and participation instructions to buildings with 1-9 units included in the pilot areas. DSNY is also recruiting large apartment buildings—on the west side of Manhattan, in parts of Brooklyn, and on Staten Island—to participate in the program. GrowNYC is assisting with this effort, and we can help your building with the signup process, and to prepare your tenants and staff to participate. Take Morningside Gardens, who joined the DSNY Organics Collection Program in June, for example. Prior to the program’s implementation, many of the residents dropped off food scraps at GrownNYC’s Columbia Greenmarket and a group of residents formed a Compost Club. GrowNYC worked with club members, property management, and the co-op board to help the 980-unit complex create a plan to establish organics collection to be serviced by DSNY. GrowNYC provided hands-on assistance in creating a suite of educational materials and training to ensure that staff and residents were well-informed about the program, which included mailers detailing the program, attendance at a series of public meetings, and signage in every trash room. With the addition of this initiative, Morningside Gardens now diverts 39% of all waste from landfills through recycling and composting, compared to an average diversion rate of 14% for their community district as a whole. Overall improvement of waste separation and storage has also reduced the presence of rats on the property. To highlight the success of the program at Morningside Gardens, Mayor Bloomberg chose the site as the location to announce the expansion of the DSNY Organics Collection Program and to launch the “Recycle Everything” advertising campaign in July of 2013. Does your apartment building want to take recycling to the next level? Get more information on Organics Collection in Large Residential Buildings and contact GrowNYC’s Office of Recycling Outreach and Education to get started. 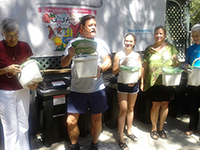 Read more about NYC Residential Organics Collection is Growing! GrowNYC's textile recycling program recently announced the Million Pound Challenge, an effort to reach more New Yorkers in order to help them recycle their unwanted clothing, linens, and shoes. We spoke to Christina Salvi, Assistant Director of the Office of Recycling Outreach and Education, about textile recycling, why it's important, and how far along we are with the Challenge. Where did the idea for the Million Pound Challenge come from? 6% of NYC's residential waste stream consists of textiles, like sheets, towels and unwanted clothing. That's 193,000 tons a year, which means that New Yorkers throw away 733 pounds of textiles every minute. We've been collecting clothing and textiles at select Greenmarkets since 2007. We were in the process of evaluating our promotion of this program when the latest numbers came in at 750,000 pounds collected. So we thought, "Let's go for a million!" Right now we’re around 900,000 pounds. Where have those 900,000 pounds of textiles been going? We partner with Wearable Collections, a textiles recycling company that gives a certain percentage of their proceeds back to charitable organizations. They not only accept material at some of our markets, but also provide collection bins and do pickups at residential buildings. Wearable Collections takes the material to a sorting facility where items are designated as usable or non-usable. The usable items will go to secondhand markets like thrift stores. Materials that are stained, ripped, or otherwise non-usable are further sorted into grades like cotton and synthetic blends. These textiles are then distributed to different markets and manufacturers that can turn them into things like car seats, insulation, and industrial rags. Where can people drop off their stuff? We are hoping to continue expansion of the program, but for now we have weekly drop-off sites at 8 markets in 3 boroughs on 4 days of the week. We also have special collections taking place during the Million Pound Challenge, like at the Bronx Borough Hall Greenmarket on November 2, 9, 16 and 23. People can bring any clean and dry textiles including clothing, paired shoes, sheets, towels, hats, bags and belts. We offer receipts for tax deductions as well. People should wash everything before they donate? Yes. It's okay if things have stains, but they should be laundered before donation. You can bring them in a plastic bag or just pack them in a reusable bag that you can empty into bins at the drop-off site. What happens if you reach 1,000,000 pounds? 1,000,000 million pounds is a nice big number, but we see it as a great place to start. Keeping textiles out of landfills helps reduce disposal costs for taxpayers and prevents landfilling of materials that could create powerful greenhouse gasses. It will be great to reach a million pounds, but we will need to keep working to divert more material from going to waste; what it would mean is that we've made that many more people aware and have activated them to participate in recycling.